Just stumbled on the latest addition to Bumble and bumble’s Surf family of hair products, and boy-o-boy, have I got a lot to say about it. In the spirit of not burying the lead, my summary of Bumble & Bumble’s new Surf Foam Spray Blow Dry is… Buy one for now, and another for later, cause it’s that good! 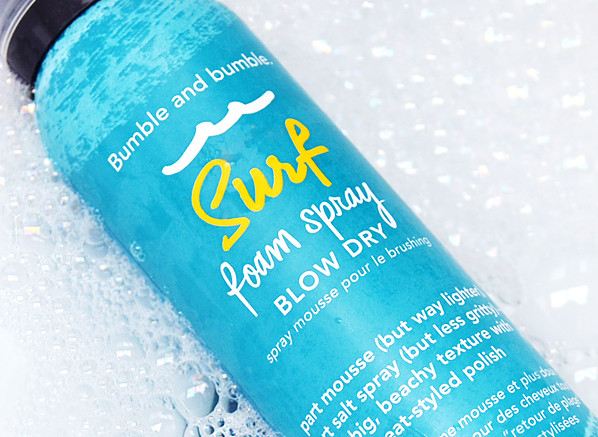 Not to be confused with the amazing Bumble and bumble Surf Spray, which has been many a hairstylist favourite for some time now, the new Bumble and bumble Surf Foam Spray blow dry has the magic touch. It has all the hold of a mousse but with a modern flexibility. So you can easily create your next undo hairstyle, or a bit of back-combing, and still have that blow dry finish with beauty textures. This is plumping and roughening stuff, and when used with strategic back-combing, I found it’s easier to get a hair band over my ponytail a few times. An unheard of feat! More importantly my hair did not get greasy at all. The product is pretty lightweight, which gives my hair some body and movement, and a much-needed lift to my long hair. The Bumble and bumble Surf Foam Spray Blow Dry is like a hair treatment, but it also delivers voluptuous blow-dryed finish without the added hard work. The coconut water and UVA/UVB filters ward off the harmful effects of the sun or heat from hairdryers. This product isn’t just for a bouncy blow dried look, any sort of textured style is achievable (from a tousled beach finish to an undone up-do) and it seems to works best for fine-medium hair types. The ultra frothy foam boasts a part-mousse-part-salt spray texture, and in true beachy-chic style, it’s incredible scent makes you feel as if the wind blowing through your hair with every spritz. What’s not to love? I recommend you buy one for now, and one for later, it cost £22 when you buy it here. Bb Surf Foam Spray Blow Dry for the win!! !